Maxline's multilayer construction can be easily bent by hand and maintain its desired shape, giving a professional appearance with no tubing sag. 100 ft rolls allow for faster installation times, with fewer joints. Its smooth interior walls will never build up scale or rust making an efficient air system. 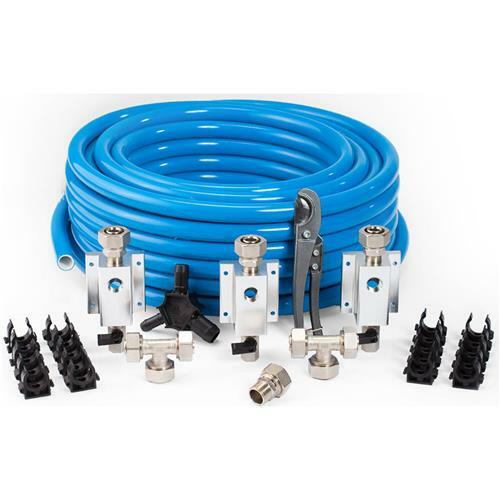 Recommended for larger buildings and tubing lengths up to 150' from the air compressor. 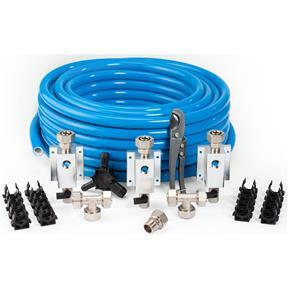 Maxline piping can be mounted on wall surfaces, in wall for new construction and be directly buried under ground or concrete. This system is easily configured and can be modified. Maxline fittings are nickel plated brass designed for years of long term performance. Its double o-ring compression design is engineered to be a leakproof system, that can be easily disassembled and reused. 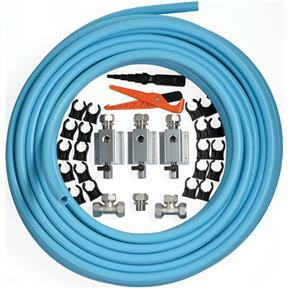 I am shopping for a mill on grizzly website and I am reminded of this kit that I bought last year, sure has been great, never a single leak, and I am thinking of adding on to it because it was so easy to install. I would recommend this to all my woodworking buddies, what shop could operate well without it? This is a necessity. Great product!